I had a dog once. 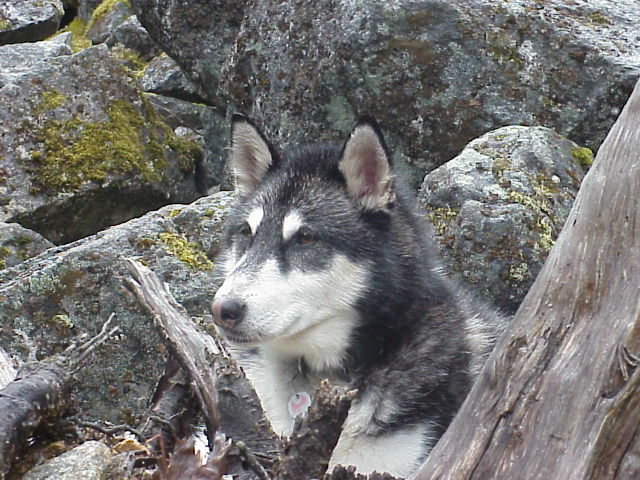 He was a Husky Malamute given to me as a gift (one of the most cherished I ever received) by a friend who rescued him from the SPCA. When I got him he was 18 months old. I named him Gus. He was a good friend for over a decade but in June 2008 at the ripe old age (for a Husky) of 13 I had to put him down because he had developed a brain tumor, had gone blind from glaucoma as a secondary effect, and was starting to have trouble breathing. I was amazed how quickly the whole thing progressed. I miss him lots, but the rational side of me recognizes that the timing was good. My “home business” had just outgrown my home and we were about to move to an office location. I was going to become a commuter… sigh. I think the transition from a life with people always around to a life of solitude would have been torture for my blind old friend. Though I miss him I’m thankful that he never had to experience that. Recently I forced myself to consider disposing of Gus’s doghouse, recognizing that it would likely be a long time before I owned another dog. I was half way through posting the doghouse for free on Craigslist when I had a novel idea. I’d been considering getting a few chickens for some time. I had even been mulling over various chicken coop designs. I thought, “Why not convert the doghouse into a chicken coop?” And so I did. 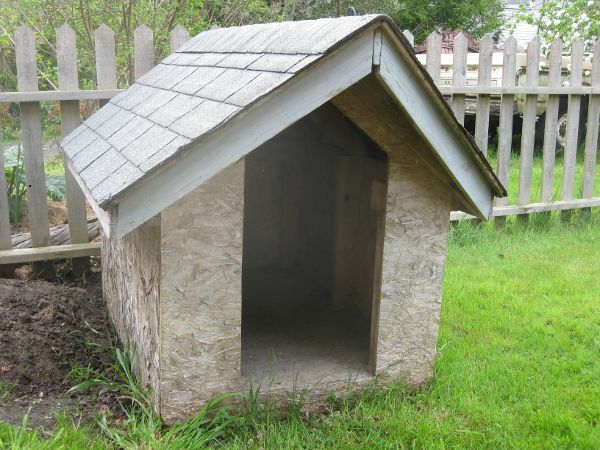 The images below show what the doghouse looked like before. These are actually the pictures I took when I was about to post it on Craigslist. I didn’t build it myself. It was here when I moved in. I did enlarge the doorway since Gus wouldn’t go inside otherwise. To convert it to a chicken coop was relatively easy. I screwed four 2×4 posts to the four corners to elevate the doghouse about 20″ off the ground. The elevated doghouse would provide both shade and shelter from rain for chickens either inside it or on the ground below it. I attached wire mesh around the posts creating a perimeter around the area under the doghouse. I added a door with hinges and latch to cover the original open doorway. The door will be used by me to access the nesting boxes to remove the eggs and to clean out the hen house and add more bedding as needed. I added some wire mesh to cover an opening above the door which provides ventilation. In the winter, I may cover this to reduce drafts. I cut a hole in the floor and added a ramp so that chickens at ground level would be able to climb up into the doghouse. I made 1/8″ deep perpendicular cuts with a circular saw every inch along the length of the ramp for grip. The ramp is also hinged. Using an easily accessible draw string, I can raise the ramp to close off access between the two levels (useful for keeping the chickens where I want them either to catch them, or to make modifications to sections of the coop). I built a couple nesting boxes that hook onto the walls inside the doghouse. I sized them to the available space. They are big enough that two chickens can fit in each nesting box. Not knowing much about chickens I wasn’t sure if two chickens would nest in the same box, but I figured I could add a divider later if necessary. It turned out not to be necessary. The nesting boxes are removable for easy cleaning and for easy conversion back to a dog house if desired at some point in the future. The new residents… three’s company. I searched Craigslist for “chickens richmond” and found a hobby farm within a half hour drive with a flock of a hundred birds or so. I purchased three chickens for $12 each. One was a Barred Rock (probably not pure bred). The other two were Rhode Island Red (also probably not pure bred). I’m pretty sure I got some of the worst birds in the flock. I would have preferred all Barred Rock if they had them, but the one I got was the only one they had left. It appeared to have a superfluous toe on each foot growing out of its ankle about a half inch above its other toes. It also had an extra something-or-other growing out of one of its feet that sort of resembled a toe but not quite. While I was carrying it back to the cage that I’d brought with me, the owner of the flock selected a Rhode Island Red which he probably wanted to get rid of. It seemed healthy enough, but was molting and had lost many feathers around its neck so it didn’t look too pretty. “What the heck”, I figured, “I don’t know anything about chickens, so I might as well just see what happens.” My friend Torbin, who I had brought along for the adventure, was amusing himself watching the show. He made a point of selecting the last chicken which was easily the nicest of the three. The drive home was uneventful. Apparently chickens are great in a cars. They don’t drool or try to stick their heads out the window or anything. Once home I installed them in the converted doghouse and waited patiently for them to discover the hole in the floor and wander down to ground level where I had placed some food and water. After two hours of waiting I gave up and showed them the way by holding each one in turn upside down by its legs and lowering it through the opening, releasing it in the lower section. They spent the rest of the day down there pecking around, eating bugs and grain, and I figured they’d never find their way back up, but I checked on them just after sun-down and they had all figured it out by themselves and were sleeping peacefully in their nesting boxes. I chose to interpret this as a sign of their approval of my coop design. Based on their names, you might have guessed that we’re not opposed to making a meal of these birds at some point, but primarily we’re interested in their eggs. 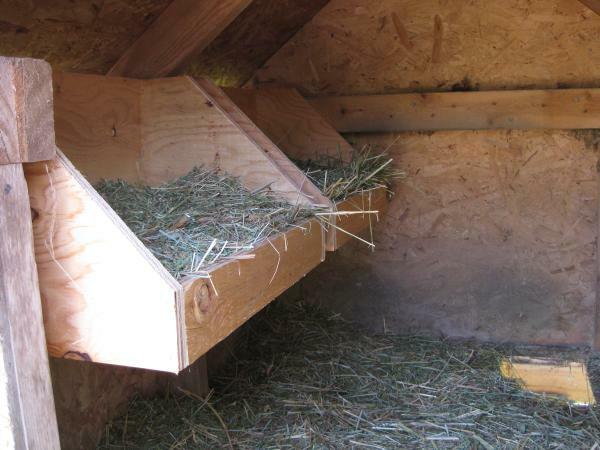 Though the size of the coop as is would technically be sufficient space for 3 chickens (much more than they would get in an industrial farming operation), it’s still small enough that it would get pretty messy and require constant cleaning. Therefore I fenced an area around the coop to provide a chicken run. I had several sections of picket fence I’d brought with me when I moved here from my previous residence. They served the purpose of fencing in the chicken run reasonably well. I was a little worried the chickens would be able to squeeze between the pickets but that hasn’t been an issue so far. The run also surrounds our compost bin which you can see at the rightmost edge of the photo. I figured this would be convenient since we could let the chickens give our table scraps a once over, and because we would be composting the chicken poop and soiled bedding anyway. I cut an opening in the wire mesh at the base of the doghouse to allow access to the run. Another piece of wire mesh (which my lovely assistant, Jenna, is holding in the photo below) was attached over the opening so the chickens could be sealed in the coop if desired. At first we made do with a simple dish for feeding (Gus’s old dog dish, actually). 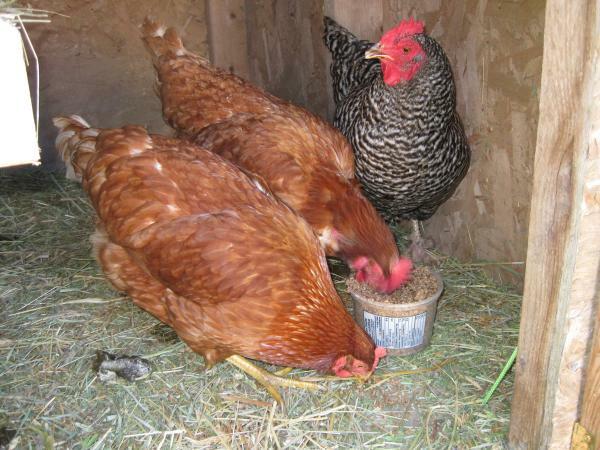 However, chickens have a tendency to be pretty messy when they’re eating. Much of the feed from the dish ended up on the ground where the chickens would scratch away at it but not eat it. The dish also required daily refilling. There are commercially available chicken feeders, but I had so far managed to get by with only re-purposed materials and felt obliged to continue in that effort. The solution, although obvious in hindsight, didn’t occur to me for a few days. We had a bird feeder that was built by a friend of mine as a Christmas gift a couple years ago. We’re not really “bird people” so it had sat empty since its initial load of bird seed was depleted. It was a relatively simple matter to relocate it to the chicken coop. I installed it on a vertical metal pipe that I just hammered into the ground to an appropriate depth so that the feed would be dispensed at chicken height. The center part of the roof is removable to add more feed. It’s double sided. One side we use for chicken feed (a 20kg bag costs about $10). The other side we use for finely crushed egg shells and sand (chickens need grit and calcium). So far it has worked very well, holding enough feed for a week or so with no noticeable accumulation of feed on the ground. 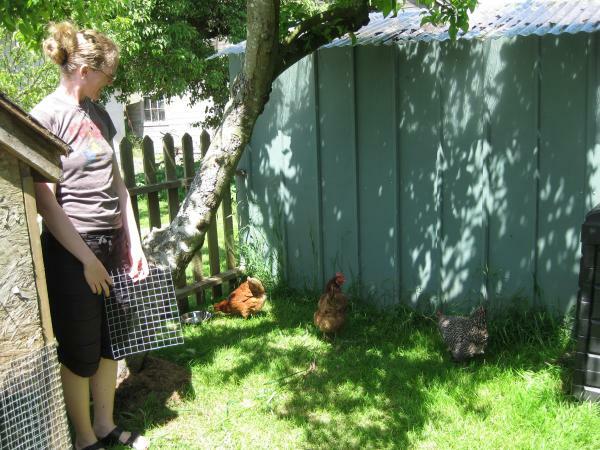 The chickens also eat bugs, worms, and spiders (and who knows what else) that they find around their yard, and food scraps from our kitchen (so far bread crumbs and apple cores are their favourites). Currently we just use a plastic ice cream bucket filled with water. It works well except for two problems. First, it kills the grass underneath it. Second, the chickens have a tendency to tip it over when it gets close to empty. I plan to replace it with a hanging waterer at some point, but it’s a relatively low priority. When I do make a better waterer, I’ll be sure to take a picture and update this page. General Tso and Ginger didn’t lay at all for the first couple weeks. Barbie laid an egg every couple days for the first two weeks and then stopped. We think she’s going into molt. Chickens molt once a year, losing many of their feathers and growing new ones. During this period they don’t lay eggs. General Tso was already molting when we got her so we didn’t expect her to lay but after the first couple weeks she started laying daily. Ginger was a pullet (a young hen that hasn’t started laying yet) when we got her, but after the first couple weeks she also started laying daily. So currently w’re getting 2 eggs a day and we expect the average to go up to around 2.5 or more once Barbie starts laying again. In the image above the three eggs on the left are from General Tso. The three on the right are from Ginger. Ginger and General Tso are both Rhode Island Reds. 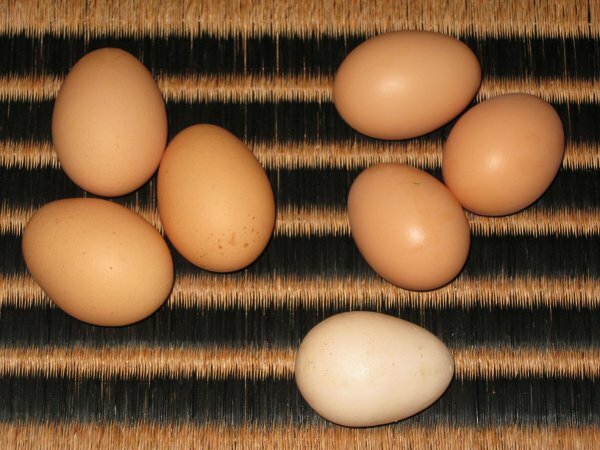 The lighter colored egg at the bottom is from Barbie, the Barred Rock. In Richmond where I live, bylaws prohibit residential homeowners from keeping chickens unless their property is over 2000 m^2 (half an acre) in size. Luckily my back yard borders on my parents’ farm so with their permission I set up the coop on their property. So don’t any of you go calling the chicken police on me ;-). 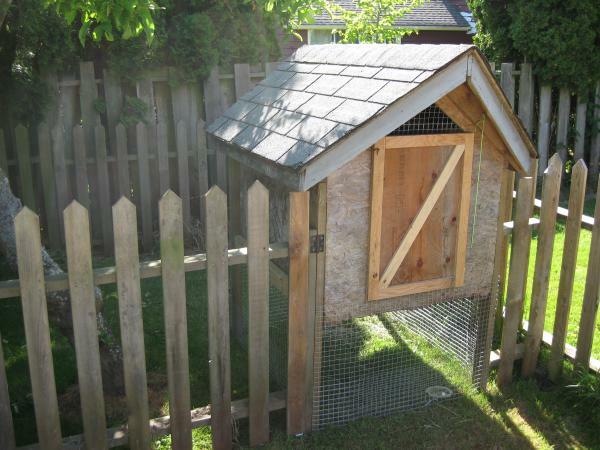 Though it is not legal where I live, the practice of keeping chickens on residential property is gaining more acceptance every year, even in very urban areas like Vancouver (right next door to Richmond), so it may be legal where you live. Check your city bylaws to be certain. If it’s not legal where you live, the worst that’s likely to happen if you get “caught” is that you’ll have to give up your flock. If you get along well with your neighbours and they’re OK with you having chickens (my neighbours were happy about it) then you might consider trying it anyway. I promise not to call the chicken police on you. Hi I have a question about your coop design. I have been trying to get a doghouse off craigslist to do this same thing. Just today someone contacted me with one, but I don’t know if it is going to be too big. What are the dimensions of your house? You did a great job with the conversion. 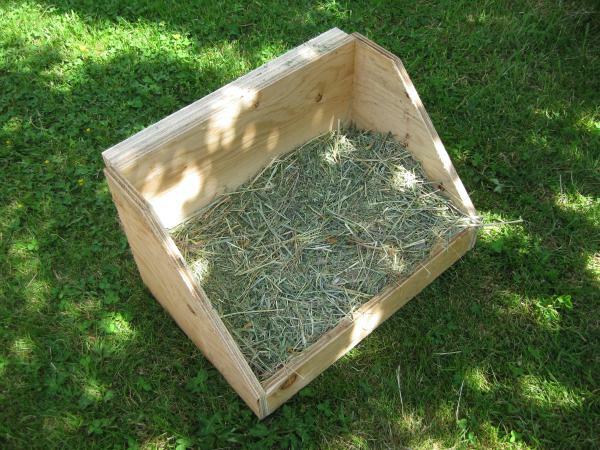 I also wondered how you made your nesting boxes detachable. Thank you for sharing this as it has helped alot already. 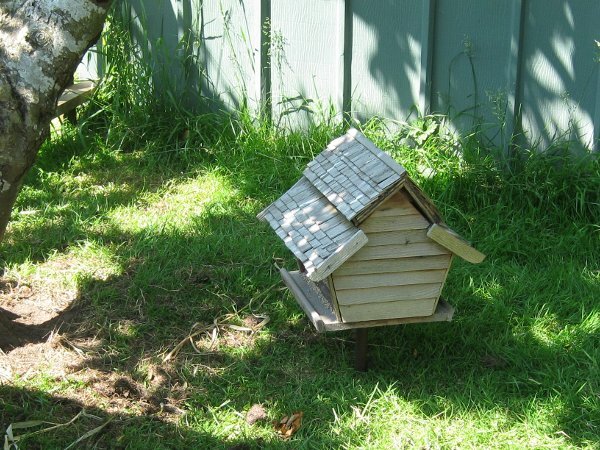 Hi Alisha, my doghouse was about 4ft long by 2.5 ft wide. I’m no expert by any means, but in the past couple weeks since I got the chickens, I’ve noticed they spend very little time in the hen house. Essentially they only go into it at night to sleep or during the day to lay eggs in the nesting boxes. So I don’t think the henhouse itself needs to be very large as long as there is plenty of space for the chickens to free range. I’ve seen recommendations starting at only 2-3 square feet per bird, but I think you’ll find the most space you give them, the less cleaning up you’ll have to do. In my dog house, there was a lip at the top of the walls. I built a sort of hook on the nesting boxes to hang over this lip. If the walls didn’t have a lip at the top, I would have simply drilled a couple holes in the back of each nesting box so they could be hung on a couple nails banged into the dog house wall. Good luck with your chickens. Good job on the coop! How many eggs do the chickens lay per week? … what do you know. I guess a chicken is not like a dog. All I know is that dogs don’t lay eggs. I updated the article to answer your question and included a picture of the eggs. had my dog kennel into a chicken coop but for one hen it was way to big. Only advantage to this system,i didnt have to clean up to often. Once a month was enough. One day i drop my chewing gum on the ground and couldn’t find it so i chewing a few to find mine……………. I don’t see a perch, do you have one. 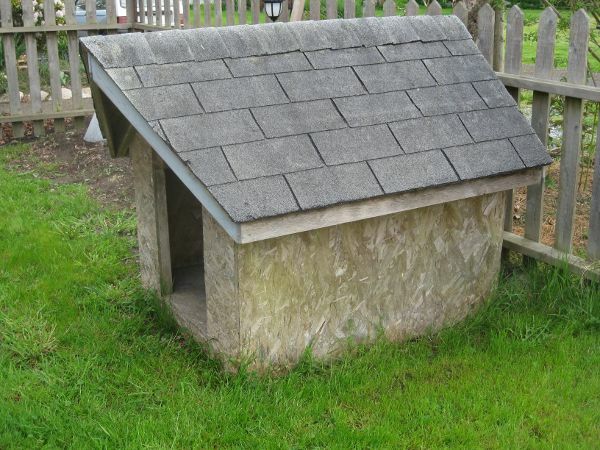 I have a dog house I wish to convert and am trying to figure out how to put in a perch. You thoughts would be helpful. My chickens spend hardly any time in the dog… er.. hen house, other than for laying or sleeping. They do tend to perch on the edges of their nesting boxes occasionally. I set up some “perch-like” structures in their yard, but they don’t use them. My advice is not to go to any great effort until your chickens let you know what they like. 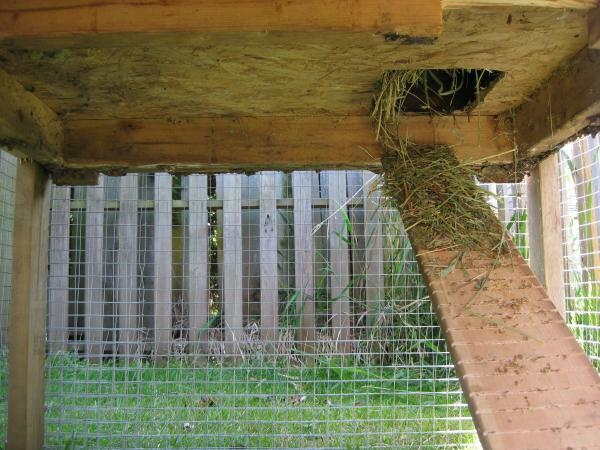 Build something makeshift and see if your chickens use it. If they do, then build something more permanent. If they don’t, then you won’t have wasted much effort. Good luck. I did the same with a doghouse I bought as a kit. I used to live in East Sooke on Vancouver Island but now live in the UK. Please excuse my City Boy ignorance. I thought you needed a Rooster to interact with a chicken in order to get egg production. Apparently a chicken will lay eggs without a Rooster. I’m guessing the laid eggs are just unfertilized. The cool thing is you have fresh eggs for breakfast and your not up at dawn because there is no Rooster. I love eating eggs, so I would love a few chickens. The problem is, I live in a city. Oh well. hi my friend is giving their old doghouse to me and i was going to use is as a chicken coop, but i have a question, can you get chicken wire at home depo? We live in the suburbs and have a hen that has been around for about 3 weeks now and visits between our yard and two other neighbor yards. It rained today and I felt sorry for it and thought about the dog house idea and found your blog. I see that your fence is not very high – every time we get near the hen it flies up to the top of our 8 foot fence. If we did decide to get another – how do you get them not to fly away? Our chickens are capable of flying over our fence (about 4 ft high) but generally they don’t. This may be in part because it is a picket fence. Chickens like to perch atop a fence rather than fly over it in one pass. Perching is not so easy on a picket fence). I believe it is also simply because our chickens have enough space, shelter, food and water where they are. If yours is a homeless chicken, that may not be the case. It is common practice to clip the flight feathers off one wing periodically (they grow back) with a pair of scissors. This will throw the bird off balance in flight. I tried it but found it unnecessary since my hens tend not to fly over the fence anyway. When they do, they don’t get into much trouble and they always fly back before dark. Hi there! Really enjoyed your story!!!!!!!! had a good laugh. my first chicken house was the dog house left at this rental.I also constructed a run out of recycled wire and posts. The worst of it all was getting inside the thing to clean it out! And im not handy enough to make a door. For nests I have seen square plastic ‘bowls’, the type people use to wash their dishes when they are camping. I came across your story while looking for something economical to buy that is more user friendly. I am encouraged to find a friend to help me convert the doghouse and save myself a couple of hundred $! I built my coop over a period of 3 years. The first year was a 8x8x6 ft chain link dog kennel with a 2×4 ft hen house. After 3 years I ended up with a 24 x 12 ft. kennel area w/ a 4×4 hen hose and a 3x8ft rooster pen using a sm. dog house i picked from someones trash for his house. Roosters though noisy at times add a nice farm yard ambiance. I did tell my one neighbor that if the noise was too much let me know. I also bribe them with eggs.